This yummy recipe has both cooked pears and crisp raw pears for a combination of flavors and textures. 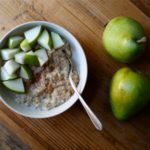 This oatmeal recipe includes both cooked pears and crisp raw pears for a combination of flavors and textures. Bring water, half of pear, and salt to a boil in medium saucepan over medium heat, stirring frequently. Add cinnamon; mix well. Let oatmeal stand for 1 minute before serving. Divide evenly between two serving bowls; top each evenly with remaining half of pear and honey (if desired).